Line large rimmed cookie sheet with waxed paper. In large microwavable bowl, add cereals and almonds. In small microwavable bowl, microwave butter uncovered on High 20 to 40 seconds or until melted. Stir in sugar; microwave 30 to 60 seconds or until sugar is dissolved. Stir in orange peel and ginger. Pour onto cereal and almond mixture, mixing thoroughly to coat. Microwave uncovered on High 4 to 6 minutes, stirring after every minute, until well coated and glazed. Spread on cookie sheet; cool completely, about 15 minutes. Carefully separate cereal pieces; stir in cranberries. Transfer to large serving bowl. 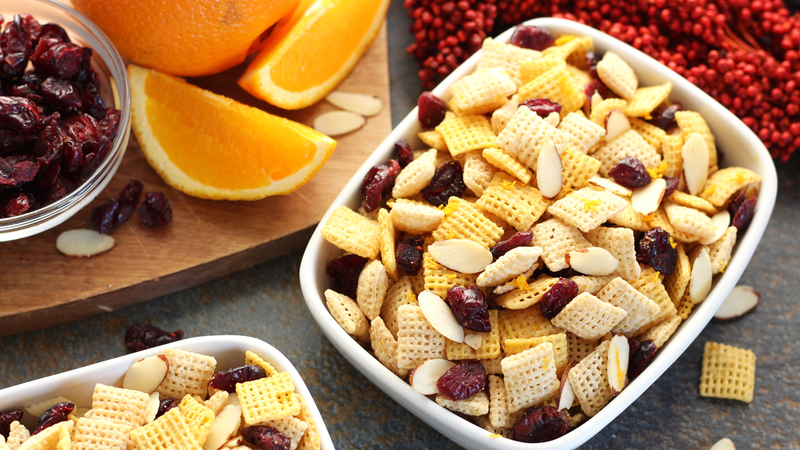 Cut-up candied orange peel would make a great addition to this mix.